Political Status of Puerto Rico: Geopolitical, Geostrategic and National Security Aspects - Links Review - Originally Published on 6.20.13, Updated on 6.27.13. What will serve the (joint, one and the same, due to a joint nature of foreign policy) geopolitical and the geostrategic interests of The United States and Puerto Rico better: statehood or the current status? 1) The Caribbean and Latin America as a battleground of conflicting political ideologies and governing models in the light and darknesses of old Russian shoe-ins and relatively newly economically expansionist China, eyeing to control trade routes with the planned Nicaragua canal, "a step that looks set to have profound geopolitical ramifications", a "project will reinforce China's growing influence on global trade and weaken US dominance over a key shipping route", according to "The Guardian". In this connection the paper mentioned the issue of " China... influencing the international court of justice to secure the territorial waters that Nicaragua needs for the project. In an op-ed piece for the magazine Semana, Noemí Sanín, a former Colombian foreign secretary, and Miguel Ceballos, a former vice-minister of justice, said a Chinese judge had settled in Nicaragua's favour on a 13-year-old dispute over 75,000 square kilometres of sea. They said this took place soon after Nicaraguan officials signed a memorandum of understanding last September with Wang Jing, the chairman of Xinwei Telecom and president of the newly established Hong Kong firm HK Nicaragua Canal Development Investment Company, to build and operate the canal." 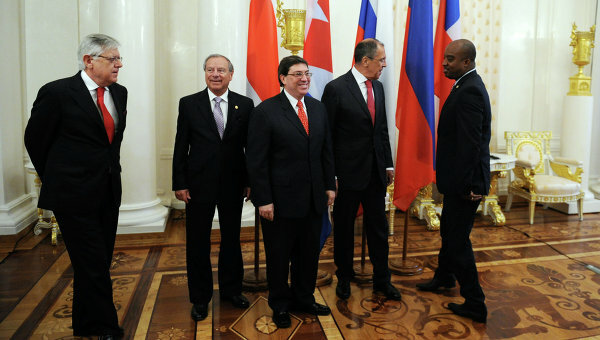 Foreign Minister Lavrov meeting with counterparts countries in the Community of Latin America and Caribbean States. As has been the case for centuries — since around the time of the first proposal for a Nicaraguan canal, in 1825 — Panama also appears to be several steps ahead. Its recent expansion effort to accommodate larger “supermax” cargo ships makes it a more appealing option now and in the future. Many experts say Nicaragua is going to have a hard time convincing investors that there are enough ships to support a second Central American canal. “Even if they did get the $40 billion, the increases in traffic are increasingly speculative,” Mr. Maurer said. Other experts agreed, noting that while Mr. Ortega and his allies would love to have a canal — viewing it as a pathway out of Nicaragua’s persistent poverty — their hopes will most likely be dashed yet again. “That the Assembly approved the project doesn’t mean that the company has found the investors to make it happen,” said Geoff Thale, program director of the Washington Office on Latin America, a human rights group, adding that as with “lots of big commercial ventures that are announced with lots of bells and whistles,” the likelihood of success was slim. The Caribbean Journal, By Zhivargo Laing CJ Contributor, June 10, 2013. ON A recent radio show in the Bahamas, the topic of China's $8 million loan to the country was being discussed. A curious caller asked, what do the Chinese want&nbs.. The Community of Latin American and Caribbean States (CELAC) states and Russia will create a mechanism for political dialogue, said in a statement issued at the end of a meeting in Moscow of the foreign ministers of the “expanded troika” of CELAC (Cuba, Chile, Costa Rica and Haiti) and Russia. “Ministers have proposed to set up a permanent mechanism for political dialogue and cooperation Russia-CELAC to discuss and coordinate positions on issues of common interest in international politics,” reads the document. According to the text, such cooperation will include promoting the principles of international law and the Charter of the UN, “to strengthen democracy and to ensure that all human rights, the fight against international terrorism in all its forms and in all its manifestations, including its funding to suppress drug trafficking and arms trafficking in the legalization of criminal proceeds and transnational organized crime. “This will be subject to the review and approval of other members of the Community at the next meeting of Foreign Ministers. Founded in late 2011, the CELAC has 33 member states. It includes the countries of the Americas except Canada and the United States, and is a kind of alternative to the Organization of American States (OAS). 2) The ever surging (and not very far in its connections from the previous issue) drug trade in the Caribbean, which besides its primary threat to the security of the mainland, fuels the government corruption in the area, undermines the legal economies and creates the excess cash in need of "laundering". It is also widely viewed as one of the main sources of rampant crime and lack of social integration in the Caribbean and Puerto Rico, tearing at the fabric of social life and perspectives for economic prosperity. U.S. State Department predicted " a surge in drug trafficking activity by 2015 as operations shift to the tropics due to a crackdown in much of Latin America." "Aerial surveys by the US Military’s Southern Command show that drug traffickers are shifting back to Caribbean sea routes in response to pressure on trafficking corridors running through the Central American isthmus. Drug networks have also adopted new tactics to evade detection, officials at the Joint Interagency Task Force (JIATF-S) told the Guatemalan news organization Siglo21. Traffickers now slow their go-fast boats, whose high speeds once made them easy to spot, to the pace of normal fishing boats and sometimes conceal them amid a fleet of up to 20 other vessels. The new maritime routes have not yet supplanted overland trafficking, DEA administrator Michele Leonhart said in a statement (see pdf here) before the US House of Representatives subcommittee on crime, terrorism, and homeland security in June. With pressure set to continue on trafficking corridors in Central America, though, it is likely the Caribbean will be increasingly utilized for drug shipments." "Though Caribbean Community (CARICOM) countries have made significant efforts in addressing the burgeoning drug trade, the United States says more still needs to be done. In its 2013 International Narcotics Control Strategy Report, released here this week, the US Department of State lauded general efforts being made, but was very critical of what it regarded as inefficient measures implemented in some countries." "It is estimated that nearly 80% of the cocaine through Puerto Rico is directed to cities along the east coast of the United States, particularly cities along the coast of Florida." "Puerto Rico Federal Affairs Administration (PRFAA) Executive Director Juan E. Hernández today announced that Senator Bill Nelson (D-FL), agreed to his request made during a meeting they held on May 8, for Puerto Rico to be included within the increased border security measures, proposed in the comprehensive immigration reform bill that started to be debated this week in the U.S. Senate." nation’s fight against drug trafficking. effectively serving as America’s Caribbean Border. enforcement agencies in Puerto Rico must be further strengthened." "Given the current controversy surrounding the extent of the U.S. drone program and targeted killings, it is important to revisit that in the summer of 2012, the U.S. Customs and Border Protection Agency announced that unmanned drones would begin patrolling Caribbean airspace as an expansion of the Caribbean Basin Security Initiative (CBSI). This is only one aspect of how the War on Drugs in the Caribbean is increasingly looking like the War on Terror. The U.S.–Caribbean border is the often ignored “Third Border,” which the Department of Homeland Security has referred to as an “open door for drug traffickers and terrorists.” A recent study by the National Defence University has stated that “the region's nexus to the United States uniquely positions it in the proximate U.S. geopolitical and strategic sphere. Thus, there is an incentive, if not an urgency, for the United States to proactively pursue security capacity-building measures in the Caribbean region.”"
raising the drug issue to the forefront of U.S. foreign policy concerns. for both Jamaican marijuana and South American cocaine. maritime terrain. Uneven political support for counterdrug efforts may also fuel drug trafficking. chain and vary in terms of capabilities, organizational structure, and level of associated violence. through deep networks of corrupt officials in key offices. violence appear to have risen. also negatively affects licit economic development." Puerto Rico statehood, as any proper marriage should, depends on the will of both parties, but, that's said, maybe even more so on the will of The United States Congress, as Mr. Pierluisi astutely mentioned in his UN address.
" We likewise recognize that the U.S. Congress could unilaterally rescind the powers it has delegated to Puerto Rico if it saw fit to do so. As a legal matter, the U.S. Constitution vests Congress with broad authority over its territories. For Puerto Rico to evolve and to become a state or sovereign nation, it is not enough to just seek such a change; U.S. Congress and the President must act to enable that change." And this respectable body and its corresponding constituents might need some "convincing framework" to form. And the above mentioned issues will not be the last ones on the future Convincing List by far. However, an inevitable conflict in the Middle East, whether we are talking about actors such as Israel, Iran, Saudi Arabia or Turkey, seems to have, at least on the medium if not the long term, an extremely important “rival” on Washington’s agenda for the control not just of the Atlantic and of the Panama Canal but also for a potential control of China’s merchant navy that will in the future look for new routes, and for enhancing the balance of power in what concerns Russian interests in the area and the relatively uncontrolled development of the military arsenal in South America. It is true that such an option is one of the United States of America’s priorities, given the fact that she needs to secure both the South Atlantic and the Caribbean in case of a possible “Pacific war,” whether military or commercial in nature. Thus, while many analysts are carefully watching the ceaseless growth of the global crisis, an artificial crisis of American origin, a small group of persons in the United States and the European Union on one hand, and in Russia, China and Latin America on the other, are carefully analyzing a possible union at federative level between the United States and Puerto Rico. It has to be said that the currency is minted at the orders of the American federal government, just like defense and foreign affairs remain the exclusive prerogative of the White House, Puerto Rico doing nothing but rallying behind the position taken by the American federal government. After winning independence from the Spanish Crown on December 10, 1898, Puerto Rico became a Free Associated State in 1952. On the basis of the “insular cases,” the US Supreme Court decided that Puerto Rico belongs to but is not a part of the US. Despite an apparent political calm due to the island’s statute, in recent years the inhabitants have started to fall within two categories: those that want their country to become the 51st American state and those that want the island to become sovereign and, consequently, independent. Debates and plebiscites on the island’s political status have taken place until now. It has to be pointed out that the first to take place showed in 1967 that a little over 60 per cent voted for the Free Associated State status, 39 per cent voted for statehood (in the form of a state that is part of a federation), while only 0.6 per cent voted for independence. In 2011 the Governor decided to organize a two-stage plebiscite in order to try to settle the island’s statute. Thus, the first stage of the plebiscite on the island’s political statute took place on August 12, 2012, people being asked to choose between keeping the same statute in relation to the federal government in Washington and a different neocolonial variant. The second stage of the plebiscite in which the citizens had to choose between three non-colonial options – statehood, independence and free association – took place on November 6, the day of the American elections. From a total of 2,402,941 registered voters a number of 2,351,158 were validated. It has to be pointed out that of the total number of votes cast, 0.98 per cent were invalidated and 26.04 per cent were blank votes. Thus, 4.04 per cent voted for the country’s independence, 24.32 per cent voted for the form of a Free Associated State and 44.61 per cent voted that Puerto Rico should become a full member of the federation as the 51st American state. In real terms this means that of the total population of Puerto Rico (with and without the right to vote) less than 25 per cent decided the destiny of the whole nation. Also worthy of mention is the fact that over 4.6 million Puerto Ricans are living in the United States (more than those living on the island), enjoying all the rights conferred by American citizenship. Not long after the official results were revealed virulent reactions started to appear from society, politicians and foreign powers, Latin American powers in particular. Latin American states that have an economic and foreign policy relatively different than that of the United States criticized the plebiscite in Puerto Rico and even suspected its results. The same suspicion concerning the results came from some American analysts that consider that in 2013 the US Congress will disregard the results of the November 2012 plebiscite. Moreover, some voices rather support a statute similar to that of Andorra which, despite the duumvirate seen at head of state level (according to the constitution Andorra has two heads of state – the French King, currently the French President, and the Catalan Bishop of Seo de Urgel), is a sovereign and independent nation. Puerto Rico has one of the most modern infrastructures in Latin America and the Caribbean, being surpassed (as national-level average) solely by Canada and the United States of America. It has 8 main cities, including the capital (San Juan, Bayamon, Caguas, Guaynabo, Carolina, Ponce, Cayey and Mayaguez) which is considered the “metropolis of the Caribbean” because of its modern buildings and which is 71st in the world when it comes to quality of life. Nevertheless, the country is confronted with the lack of a general planning project, a fact that affects the environment because it does not offer protection to the island’s natural resources. According to a survey, if development were to continue at the same unplanned rhythm in the next 700 years Puerto Rico would be at risk of becoming an island city. The city’s railway infrastructure is very modern and will be expanded at national level in order to connect all of the country’s main points, and will include a line to the international airport. The only nuclear power plant in the Caribbean is located in the Rincon municipality. When it comes to the maritime infrastructure, the port of San Juan is the fourth-busiest maritime port in the Western Hemisphere, the tenth-busiest in the United States and is 17th in the world when it comes to the handling of containers. Likewise, it is considered the world’s largest port for private and pleasure crafts, and is second in the world after Miami when it comes to the number of cruise ships it can accommodate. Apart from the main port the island has eight other smaller ports with the Port of the Americas set to be renovated and enlarged. The Luis Munoz international airport is the island’s largest airport, located 12.7 kilometers from its historic centre, near the Carolina municipality, being one of the busiest airports in the Caribbean and a vital air transportation junction for air traffic between the United States of America and the rest of the Caribbean islands. Fernando Ribas Dominicci is the second largest airport, being mainly used for private, charter or internal commercial flights. It was the largest airport on the island before the Luis Munoz airport was inaugurated. Infrastructure played an essential role in the island’s economic development for two reasons: commercial (given the geostrategic and geo-economic position) and tourism-related. Given this geopolitical and geostrategic context, one should not forget the major geo-economic interest that Russia and China can manifest given the fact that their interests in the Western Hemisphere continue to develop in parallel with those of the United States. Starting off from this, we have to point out that Puerto Rico has Russian and Chinese communities. The Russians are called Russian-Ricans and they consist of a small community of approximately 50 families that are actively promoting Slavic culture on the island, organizing on a yearly basis festivals and events meant to draw attention to Russia. This might seem insignificant, however taking into account the small number of inhabitants and the aspects that have to do with the political opinions of a certain category of Puerto Ricans in regard to the US policy, it should not be neglected. The Chinese minority in Puerto Rico has a history that can be dated back to the start of the 19th Century. The community is currently growing and is mainly active in the gastronomical and cultural domain. Because the island is under United States jurisdiction arrests of Chinese immigrants took place lately. An analysis of Russia’s and China’s interests in Puerto Rico and the Caribbean will follow in another article. Illegal immigration of Chinese nationals has become a problem in Puerto Rico. On November 28, 2007, the United States Immigration and Customs Enforcement (ICE) announced that 15 citizens of the People's Republic of China were arrested and indicted for human smuggling. According to the indictment, the defendants participated in an alien smuggling organization operating out of the Dominican Republic and Puerto Rico. The organization was transporting, moving, concealing, harboring and shielding aliens. They arranged the transportation and moving of Chinese nationals from the Dominican Republic into the United States. May 3, 2012 – Caribbean islands are aggressively courting new tourism markets headed by South ... “We are working very hard to strengthen Puerto Rico's presence in these ... outbound market, followed by the United States and China. Jun 4, 2013 – Comprehensive collection of newslinks to Puerto Rico, The Caribbeanand The Latino Culture - Amplia colección de newslinks a Puerto Rico, el Caribe y la Cultura Latina ... LONDON, England -- An all-party group of British members of parliament, established to further the interests of the Cayman Islands, should be closed down, a senior member of the House of Lords, Lord Oakeshott, said on Monday. The House of Commons standards committee is looking into. Mar 21, 2013 – Julio Ramos Oliver died over a spilled drink. It was just after midnight January 20, and Old San Juan shook with the fiesta de San Sebastián. Under the golden glow of street lamps, more than 100000 Puerto Ricans. Illegal drugs in Puerto Rico are an increasingly significant problem from a criminal, social, and medical perspective, and a large amount of crime in Puerto Rico has been linked to the amount of illegal drugs that flow through the country. Located in the Caribbean, Puerto Rico has become a major transshipment point for drugs into the United States. Violent and property crimes have increased due in part to dealers trying to keep their drug business afloat, using guns and violence to protect themselves, their turfs, and drug habits. Crimes related to drugs are not the only crimes that has plagued the island. Police and political corruption have also been problematic, as have gangs, which further contribute to the drug problem and associated crime in Puerto Rico. The Puerto Rican government has implemented a series of law enforcement operations in relation to the federal "war on drugs" in order to minimize drug-related crimes and trafficking on the island. In 1985, the government started Operation Greenback, an investigation by the FBI, Internal Revenue Service (IRS), the Department of Justice (DOJ), and the Drug Enforcement Administration (DEA), into the inconsistencies between the drastic increase of cash flow into the Puerto Rican economy and the double digit unemployment rate and bad economy in the 70s and early 1980s. The operation uncovered money laundering schemes from within financial institutions and from the sale of illegal lottery ticket sales. Federal agents raided 10 banks and arrested 17 people on money laundering charges. In 1990, Operation Lucky Strike, was put in motion by the FBI and local law enforcement officials, when residents of Vega Baja unearthed $20 million dollars on a nearby farm. They tried to stop the circulation of the illegal money and mobilized to arrest the individuals connected to the money. In 1993, the Puerto Rican government used the National Guard to help local police in controlling street crime, and later used them again to occupy about a dozen public housing projects in and around San Juan, that police deemed as "hot spots" for drug-related crimes. The operation produced the seizure of 1,200 bags of cocaine, 216 bags of marijuana, 369 capsules of crack, 1,142 bags of heroin, 3 kilos of rock cocaine, and 1 kilo of heroin. “The Caribbean has never downplayed the importance of the United States to ... those involved in the illegal drug trade to target the Caribbean. May 29, 2013 – Working together in support of the Caribbean Basin Security Initiative (CBSI), the United States and the nations of the Caribbean are combating the drug trade and other transnational crimes that threaten regional security. May 28, 2013 – Working together in support of the Caribbean Basin Security Initiative (CBSI), the United States and the nations of the Caribbean are combating the drug trade and other transnational crimes that threaten regional security. The Dominican Republic and Drug Smuggling via the Caribbean Mexidata.info To break the cycle of narcotics trafficking and the accompanying violence by organized criminals and gangs, as they increasingly (and once again) make end runs via t..
Dec 16, 2009 – OBAMAâ€™S STRATEGIC MOVES ON PUERTO RICO â€“ Could Sotomayor Influence the Puerto Rican Status Issue? 9:00 AM BY MAEGAN LA MAMITA MALA – POLITICS| PUERTO RICO| WOMEN 1Jun2009 – VivirLatino. The United States-Puerto Rico Political Status Act (1998) was a bill proposed in the United States Congress to help refine the political status of Puerto Rico. 1. don’t comply with international law that prohibits a nation to have a colony. 2. don’t comply with international law that requires the empire to give the sovereignty it illegally took away to its colony. 3. don’t comply with international law that requires that to have free elections, that country must be free first. 4. have 2 options that are not permitted by international law- continuing being a colony and becoming a state of the country that has the colony. For the option of becoming a state of the country that has the colony to be considered, the colony must first become her own nation (decolonized).